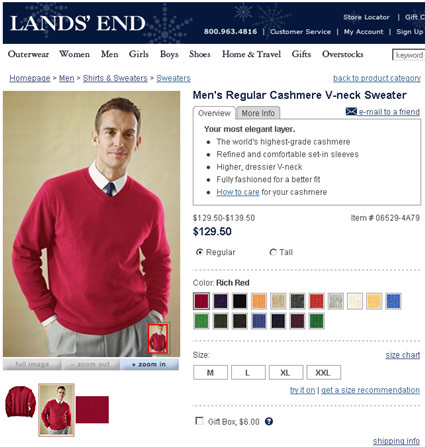 I started my visit to Lands End by clicking Men, Shirts & Sweaters and then Sweaters to get to the browse by listings you see below. 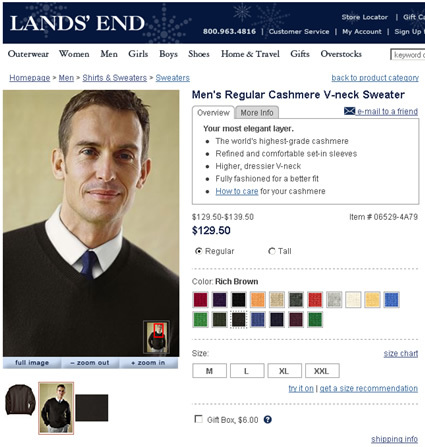 As I was looking at the listing of sweaters, I rolled over one I liked and the product view changed on rollover to a model wearing the sweater. 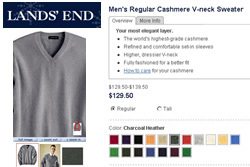 I found this to be a great way to give potential buyers a second view of the product right from the sweater listings (and not necessarily on the product detail page). The view showed the sweater on a model so you can see it in context (and not just on a white background). Reference photos below. Then, right below the product image, I noticed several swatches. Clicking a swatch changed the product image dynamically, without post-back. Post-back is developer-speak for when your browser completely refreshes the webpage, which takes unnecessary time. I really like this functionality in the browse by listings…it was intuitive, provided value, and enabled me to see a wide array of sweaters in different colors and on a person. I love it. :) OK, let’s click through to the product detail page to get a closer look. 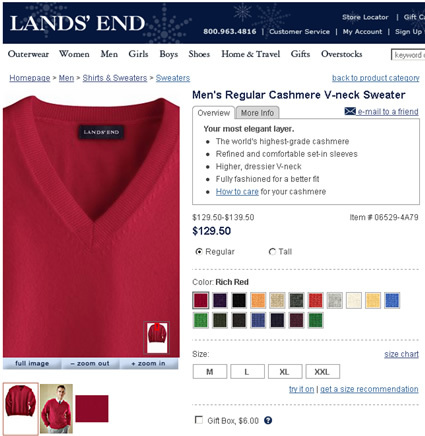 Once on the product detail page, Lands End gives you several options for getting up close and personal with the product you are viewing. First, you have a nice product image (full view). Let’s get a closer look. 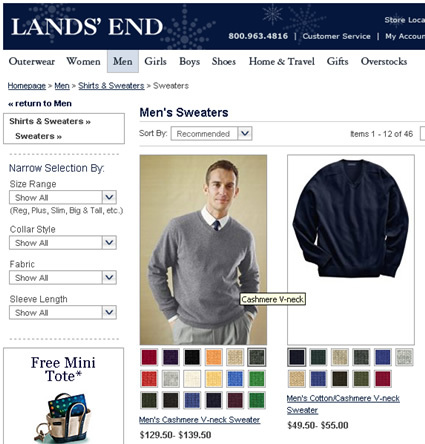 Below the image, Lands End provides their pan and zoom functionality, which is one of the best I have seen on the web. You can either click the image to zoom in or click the “zoom in” button below the image. Either one lets you zoom into the product to view more detail. I was able to zoom in at a granular level (actually further in than I really needed to, but some people would want to see the fabric as closely as possible). It was easy to use and the response time was excellent. Below the pan and zoom controls, there are a few additional thumbnails. For my example, you can see the full sweater, the sweater on a model, and then a fabric swatch. When you click each image, the larger product image above changes to what you selected. Then you can use the pan and zoom functionality on the new image. Outstanding! If you choose the swatch thumbnail, then you can take a closer look at the fabric, which I can guarantee decreases product returns… More on this later. On the right side of the page, you’ll find a list of swatches so you can easily change the color of the product you are looking at. Again, this is completed without post-back, which is fast and seamless. In addition, the thumbnails below the pan and zoom functionality also reflect the change in color (the full product view, the product on a model and the fabric swatch). Nice touch. What’s The Effect on Your Buying Experience? 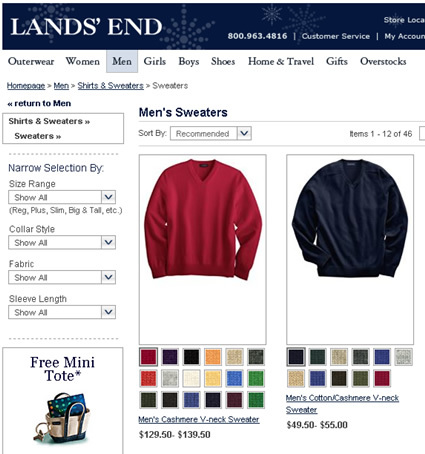 In addition, Lands End is making its web operation more profitable by providing functionality like this. I bet their product returns from web purchases are lower than other retailers. How could it not be?? You are getting an incredible view of a product you are interested in…it’s almost like you are in a store for crying out loud! OK, maybe not that good yet…yet. 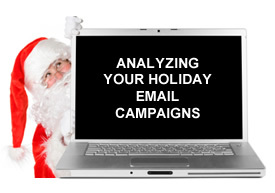 As the holidays approach, chances are you will be launching several email marketing campaigns. Busy holiday marketing schedules heavily rely on email to connect with customers, promote holiday sales and offers, and to drive revenue. With the flurry of emails you’ll be sending out, analyzing your campaigns is critical to improving their effectiveness. Utilizing a robust web analytics package is a great way to scientifically determine what works best for your specific customer segments, and maybe more importantly, what doesn’t work. So, I decided to write a post that covers analyzing your email marketing campaigns by properly tagging your email links (for analysis in Google Analytics). Then you can break down and analyze your email creative at a granular level in your analytics reporting. Tagging is the process of adding querystring variables to links in your online ads so your analytics package can detect and then associate each link with a campaign. Then you can access reporting based on visitor activity. For example, tagging a banner so you your analytics package knows which website the banner was placed on and which version of the banner led to a click through. The reporting will also provide important metrics for your campaigns such as site activity, sales, conversions, bounce rate, etc. Tagging is critical to understanding how your marketing campaigns are performing. This is the source of your marketing campaign, so for our purposes “InternalEmailList” will work just fine. Just remember to keep this consistent for future campaigns to your internal email list so you can easily segment and aggregate your reporting data in Google Analytics. Other examples of Campaign Source are websites you are advertising with, shopping engines, a search engine like Google or Yahoo, PRWeb, etc. It’s basically the source of your campaign traffic. This is simply the name of your campaign. Note, you should use a descriptive name here, since it will show up in Google Analytics under the Traffic Sources tab in Campaigns. Medium identifies the marketing channel you are utilizing for your campaign, such as email, banners, search, pr, etc. Obviously for our example, we’ll use email. I saved this for last, since it’s what we’ll be focusing on for tracking your email marketing creative. You should use a different value for utm_content for each section or specific link in your creative. This enables you to view reporting based on the content breakdown in your email creative (which will help you determine the value of each element in your email). More on this later. Note, this is a simplified example, and you may choose to get more granular in your own email creative. For example, you may choose to tag each specific link in the footer versus tagging all of the links in your footer as “FooterLinks”. Each of the links in your email should contain this querystring using all 4 of the Google Analytics tracking variables I listed above. You can also utilize Google’s URL Builder to help build your links. OK, so you blasted out your email campaign yesterday and you are eager to see how it’s performing. Log into Google Analytics and click the Traffic Sources tab. Then click Campaigns. You should see all of your campaigns listed here for the time period you selected. For our example, you would see a listing for PreThanksGiving, since this is the name we gave our campaign earlier. Simply click this listing to view reporting specific to this campaign. At this point you can see the summary for your email campaign. You can see the number of visitors, avg time on site, bounce rate, etc. You can click the Goal Conversion tab to view the number of conversions from your campaign, and you can also click the E-Commerce tab to view revenue, number of transactions, etc. But you shouldn’t stop there… You can drill in further to view which elements are performing well in your email creative. Click the Site Usage tab again in your report. Now, click the Segment dropdown and select Ad Content. You will now see each of the links you tagged in your email creative. Cool, right? Now you can view detailed reporting based on each element in your email. Why is this important? You may find interesting customer behavior that will enable you to drive better performance in future blasts. You might see that 75% of visitors clicked the product photo versus the offer. Based on that piece of data, maybe you expand your imaging in the email to include other views of the product to see if it increases your click through rate and sales. Or, you might find that a headline next to the photo draws more visitors than a headline above the photo. So on and so forth… You get the picture! When you break it down, your customers are unique and you might find that certain elements perform extremely well and others fall flat. Now click the E-Commerce tab and view sales data for each element. You might find the product photo generated 70% of the revenue from the campaign. You might also see 10% of the revenue coming from the footer links. Why? Maybe customers aren’t sure who you are! Most people receive dozens of emails per day from companies they have purchased from. If you are a smaller company that is still building your brand, it might take customers a second or two to remember who you are… If you see trending that shows people clicking through your About Us link, you might want to promote your company and/or brand more in the email creative. i.e. Provide an About Us paragraph in the right sidebar of the email. This is obviously just an example, but you might find some important data from reviewing reporting like this… Back to our analysis, if you click the Goal Conversion tab, you can view conversions from each element in your email. Now you can track sales, newsletter signups, RSS subscriptions, etc. for each element in your creative. You might find certain email campaigns generate a lot of newsletter signups but only a few sales. You would obviously want to dig deeper and find out why that is…but you wouldn’t know unless you track it! Using this technique, you can break down your creative and tag each link so you can view detailed reporting for your email campaigns. During and after each campaign, you should check your reporting for trends in customer behavior. Then test out new ideas and drive elements that perform well. Over time, you can refine your campaigns to maximize your email marketing efforts. So, if I’ve done my job well, your next move is to run down the hall and grab your email marketing coordinator screaming, “Hold That Blast!” so you can tag all of your links! ;-) Then you can enter meetings armed with data versus opinion!